There is a $49 minimum for purchase orders. Submit your order online with a PO number, and once approved, products will be shipped and an invoice mailed. Online ordering will estimate shipping for you (within the US only)! An approved PO will also generate an email to the subscriber with information on how to activate their subscription(s). Note: We must have the email address of the subscriber to send them their subscription. If you are ordering for several teachers, the teacher whose email you give will be the subscription manager and will add the other emails. Ordering on line is best! 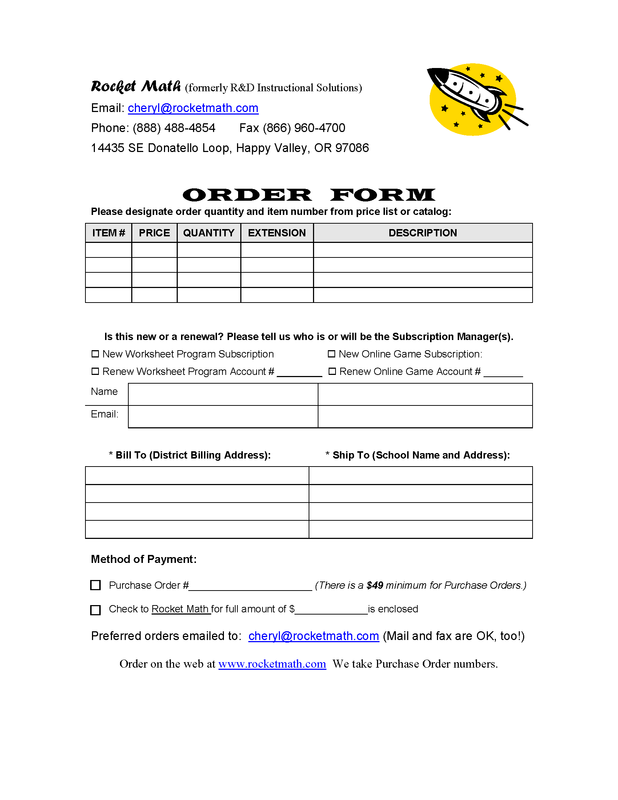 If not ordering online, use this order form. 2019 combined price list and order form, and do include the subscriber’s (teacher’s) email! Do we need to be added to your approved vendor list before you can order or submit a purchase order? Download the Rocket Math W-9 to get the ball rolling. If you have any questions, please feel free to contact Rocket Math with questions.